The craze for affordable log-burners and wood-burners has risen dramatically in recent years, particularly in the UK as people seek out safer and more efficient alternatives to open fires and fireplaces. Wood-burning stoves and log-burners are much the same thing – they are stoves that are typically constructed from cast iron or steel, which burn natural fuels such as logs, pellets and other kindling. They are connected to a flue system that removes the resulting hot gases, allowing your home to benefit from a cosy, warming stove that has a certain rustic charm compared to an electric fireplace. A stove which really kicks the heat out in medium rooms, this is a perfect stove if you want control over your heat output. It can just tick over if you need a little boost, with the air vent system giving you the ability to close over the vents. This makes it perfect for all year round use, with little boosts in the spring and autumn and full power in winter. The build is also great – it is strong and sturdy without being overpowering in terms of weight and size. It looks traditional, without being too dated so would look just as in place in a fully modern living space. It does take a little while to get going because of the air vent possibility, but it isn’t painfully slow and is worth it for this ability. On top of this, there is a 79% output ability and interchangeable top and rear flue option. This doesn’t just make it affordable to run, but also flexible for any space. If you need a little stove which gives out enough heat to save a few dials on the thermostat and mostly looks the deal, look no further. It will fit nicely into any open alcove fireplace area. It can burn both wood and solid fuel so you can pick which suits your lifestyle. Whether it be wood, coal or peat, the flames are certainly able to make a statement. A 76% heat efficiency means little will be wasted, either. The heat output isn’t the largest, so it is best for smaller areas or to offer a heating boost as opposed to warming up an entire large room. But it is a very stylish model which feels robust. The mid-range price is worth that little bit more for the build and overall look. With a very generous 7kW heat output, this stove packs a punch, and you can really feel the heat. There is 76% heat efficiency, so it is cost effective to run as well. It has the looks, too – a large viewing window really adds to the atmosphere, allowing you to view the flames and create a warm glow in the room. The powdered finish will keep it looking as good as new for a long time to come, with little chance it is going to rust or start to flake over time. To keep it clean, a polish on the outer will get rid of any marks. There is a removable ash pan and glove included so you can stay on top of this. Airwash technology also keeps the inner as clean as possible, so you have that nice view for longer. If you burn the recommended fuels, it will keep emissions low. You will need a brick or stone chimney pot rising out of the rooftop. But on a positive note, this means it can slot nicely into an already existing fireplace cutout if you’d like something that is a bit less energy consuming. When considering the output and style, we think that the higher end price is entirely worthwhile and justifiable. It will be both effective and look great in larger rooms, and you will certainly feel the difference in the colder months. A nice little stove which can comfortably heat a small room. This model from Lincsfire is easy to clean and doesn’t require masses of wood to run, keeping costs down. One log will last around 30 minutes, and smaller logs are the best fit if you don’t want to be chopping them all in half before use. Bear the dimensions in mind before you buy in bulk. It will burn both wood and charcoal but not coal, which still gives you plenty of options, and the flue is sold separately but can be placed either top or back. This lets you have more freedom over positioning. The stove gets quite hot on the top but not quite boiling point. Great if you want to keep a kettle warm without having the cooker running. Or, you can comfortably start the water off on the stove and give it a final blast on the hob, ready for your perfect cup of tea. Dimensions are small enough to allow it to fit in a small fireplace cut out on a hearth. If you keep on top of the cleaning, it will make life easier, and the glass wipes clean once cool. We saw that the fastenings of the door worked loose after a little while with the opening and closing. But they are simple to tighten up again and this can be done periodically. An efficient and compact stove – perfect for small lounges. 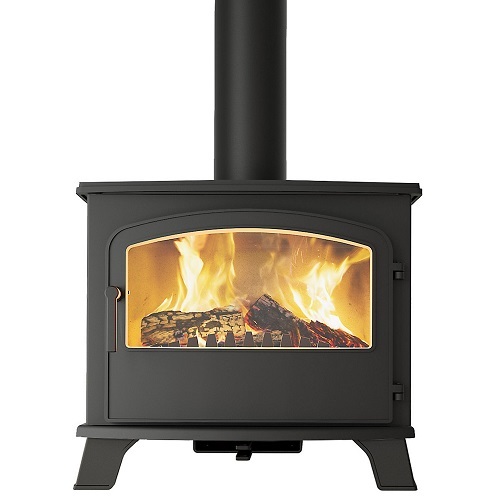 We love this small yet well-built wood-burning stove from T G Outlet. Due to its size, it would be an ideal stove for someone with a small fireplace who wants to get plenty of heat into their living room. Made from traditional cast iron with a long lifespan, this little multi-fuel-burner has a nice finish and offers great value for money. We think it would make the ideal first stove for someone looking for a more efficient alternative to a conventional fireplace. Even better, you can expect significantly reduced heating bills. It’s multi-fuel, which means you can burn coal if you wish. It has a removable ash pan, making it much easier to empty and clean. The airflow control function means you can leave it to slowly burn overnight, to keep the house nice and warm for when you wake up in the morning. There is also an 80% efficiency level, which makes it a great investment in the long-term. This Lincsfire Harmston stove has some pretty nifty features that make it a great choice for a small household. Great for kicking out a generous amount of heat while being very efficient, this stove is well worth the price. It only uses around 25% of the fuel of an open fire, which will save you money and also reduce emissions. There is an 81% efficiency rating, too, so you’ll feel pretty much every single bit of warmth. A bag of wood goes a long way with it. An air-wash system produces less ash and by-product than ordinary stoves, which means less cleaning for you. A brick or stone-build flue will be required, with a chimney pot which rises out of the roof, to get rid of the emissions. Fitting and installation is best if done by a professional which comes at an extra cost, but we liked the little added touch of a free heat resistant glove and pot of touch up paint included in the purchase. Ignore the price - it is fabulous, and you can't put a cost on warmth. For under £200, this is a neat and efficient little stove which gives out a great amount of heat. The efficiency of this heat is 76%, which you can certainly feel on a chilly evening and is great for the price. We loved the styling of it, with the contrast of the cast iron black body and gold handles. It looks very traditional and would look lovely in any living room or dining area. It requires a brick or stone chimney flue, with a pot which reaches out of the top of your property. Complete with purchase is an ash pan, grate and a connector spigot, so you’re pretty much ready to go upon delivery. Looks great, works great and is easy to manage - a steal of a price, too. Log-burners typically come in two variations – radiant and circular. Circulating stoves heat air internally before sending it out into the room, whereas radiating stoves simply generate and radiate heat as they go. They are traditionally made from an outer shell of cast iron or steel. Though not as efficient as a modern boiler, they are a marked improvement on previous generations of wood-stoves. In most places in the world, burner-wood is fairly easy to come by. It is an affordable and renewable resource, and if you do a little scavenging, sometimes you don’t have to pay for it at all. Any that is untreated and free of infestations makes great kindling for your fireplace. And if you want to neutralise your carbon footprint, why not plant a few trees along the way? The downside with burning wood is that despite being a natural material, you are still releasing a lot of chemicals into the air – carbon monoxide, nitrogen oxide, etc. It is not a clean fuel, by any means. For this reason, it’s vital to make sure that you buy your wood-burner from a reputable source, who will ensure that your stove is correctly sealed to avoid smoke seeping into your home. Heating appliances in the UK are now required to meet a minimum efficiency rating of 65 percent. Of course, some are higher than that, and the higher they are, the more efficient they will be. Most fall somewhere between 60 and 80 percent. By comparison, the efficiency of something like an open fire or gas fire is around 30-50 percent, so by choosing a wood-burner you are certainly selecting a more efficient option. To get the maximum efficiency out of your stove, look for one that has a high efficiency percentage and that uses ‘cleanburn’ technology to help disperse gas and smoke. Some models of log-burner use a catalytic converter – an item which should be replaced every few years – to help make the most out of your fuel. When it comes to log-burning stoves, one size doesn’t fit all. You should choose the size of your stove based on where it will go in your home, and how much space it has to heat. The heat output of log-burners is measured in kW and usually ranges between 3 kW up to 15 kW or more. In theory, these appliances eventually pay for themselves because your energy bill will be reduced. While there is an initial investment to pay for the stove and installation, plus the ongoing costs of kindling, over time it is possible to make some savings. When it comes to the installation, it’s always a good idea to hire a professional, unless you happen to be one yourself! A log-burner that hasn’t been installed correctly can be a real hazard, both in terms of fire risk and smoke or gases being released into your home. It’s always a good idea to speak to your home insurance company before buying or installing your appliance, to see what their terms are, so you know you’re covered. You may find that your premium slightly increases, but of course it’s worth it should something go wrong. Wood-stoves should be placed against interior walls rather an exterior ones where possible – this will help to minimise heat loss. Ensure that any leaks or lack of insulation are addressed beforehand, and that you have all the necessary precautions in place to run your burning-stove in a way that is safe and efficient.